OK, I have an admission…I got this quote from a fortune cookie. I’m smart enough to know that there is not a wise man sitting in a room coming up with these profound sayings for Fortune Cookies (insert any reference to the movie “The Last Dragon.”) But, sometimes you do find a nugget of truth within these little dessert cookies. “Of Riches” – In this interpretation, Riches reflect knowledge and wisdom. Too often we correlate success with financial status and gain. But there are several people who have all of the money in the world, and you would not trust to lead you out of a paper bag. Striving for knowledge and wisdom is an ongoing journey, not predicated upon your financial situation. Plus, it is an asset that can never be taken from you. “Shining Upon You” – Think of this as the spotlight. As you succeed and grow, your light begins to shine more (your influence on others.) As you grow, you grow others. Concurrently, the light that is shining on you (the influence that others have on your grow), increases. 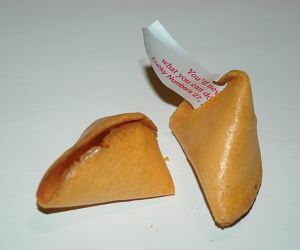 You will now look at fortune cookie messages differently for now on….. Thank you for the honor. I have been blessed by your blog and look forward to continue to read. Thanks again.